Evergreen vine and groundcover - Shade only, cannot tolerate full sun. 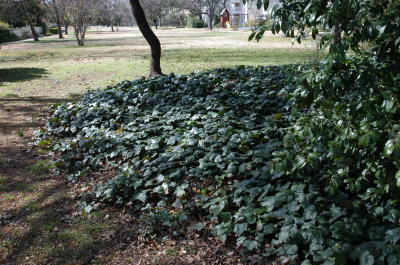 HABIT: Beautiful groundcover that has oval to heart-shaped slightly cupped leaves, 3 - 7" wide (largest leaves of all ivies). Will climb aggressively 10 - 40' if allowed and can travel that far in spread. CULTURE: Regular water and fertilizer needs. Very tough and easy to grow. Zones 6-11. USES: Groundcover for larger areas, mostly for shade. Better looking and less problematic than English ivy. 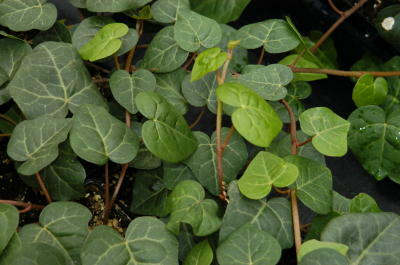 The leaves are prettier and it does not get black spots and other diseases that plague English ivy. PROBLEMS: Not as easy to find in nurseries as English ivy. NOTES: One of my favorite groundcovers. Much better than English ivy. Should be used more. Hopefully the other landscape architects will start specifying it. Persian ivy is a wonderful groundcover for shady to partly shaded areas. It is just as cold tolerant as English Ivy but much less susceptIble to fungal leaf spot. It is also more drought tolerant than English ivy.